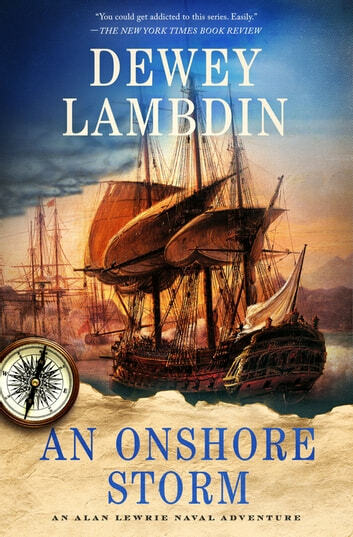 For over twenty years, Dewey Lambdin's devoted fans have followed the adventures of Alan Lewrie, Royal Navy, from his days as a midshipmen to captain of his own ship and, though on somewhat dubious grounds, a baronetcy. Now comes the latest in the Alan Lewrie naval series, An Onshore Storm, where Lewrie will take on his roughest adventure: maritime life beyond the navy. Three mismatched troop transports, lots of 29-foot barges, and an under-strength regiment of foot—a waste of Royal Navy money, a doomed experiment, or a new way to bedevil Napoleon’s army in Italy? Either way, it’s Capt. Sir Alan Lewrie’s idea, and it seems to be working, with successful raids all along the coast of Calabria. But it depends on timely information, and Lewrie must trust Don Julio Caesare, a lord of a Sicilian criminal underworld, and his minions, or the amateur efforts of a disorganized network of Calabrian partisans always in need of British arms and King George III’s money. When at last the fourth transport arrives with reinforcement troops, what seems to be a blessing could turn out to be the ruin of the whole thing! Lewrie has been too successful in his career at sea and he’s made bitter, jealous enemies with powerful patrons out to crush him and his novel squadron, no matter if it’s succeeding. And there are doings back in England that Lewrie would prefer to deal with but can’t. Lewrie has always been lucky, always finding a way to prevail—but can he this time? And if he is to be betrayed, who will do it? Lambdin has been praised as the "brilliantly stylish American master of salty-tongued British naval tales" (Kirkus Reviews) and doesn't disappoint with this riveting addition to Lewrie's adventures.